Dinner with Eric Ripert and Fabio Viviani! A couple of years ago, I finally convinced J to take me to Le Bernardin. I have been a fan of Eric Ripert for many years, and longed to try his food. It did not disappoint. I don’t remember what everyone else at our table had, but the tuna carpaccio and dover sole that I ate are forever in my memory. Never in a million years did I think I could make that tuna in my own kitchen, but I was reading the Le Bernardin Cookbook and the recipe for Tuna Carpaccio with Chives actually looked doable. 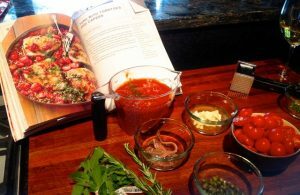 I had also just made a big batch of Fabio Viviani’s Tomato Sauce with Garlic and Oil, and had planned on making his Tuna with Tomatoes and Capers last night (from his new cookbook, Fabio’s Italian Kitchen), so I decided to use some of the sushi quality tuna I had to attempt the carpaccio as well. When H was still at home, I always had to worry about preparing something for her that had protein, but was vegetarian, so I probably wouldn’t have attempted such a fish-heavy meal, but that’s one of the benefits of having an empty nest-I’m just cooking for me and J. We just arrived in Lake Toxaway, for the first three months of summer, and I had just re-stocked the kitchen. 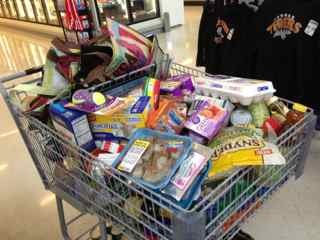 I got the extra large cart at Ingles, and it looked like I was buying for a family of ten! This cart doesn’t look too healthy, but I promise the bottom is filled with produce! I went to the local organic food market, Food Matters, and picked up some nice tuna. I’m still learning what types to avoid in an attempt to buy sustainable, but it’s very confusing. For now, I trust this market, because they’re committed to sell organic food grown in the region to protect and preserve natural resources. And I won’t ever eat or buy bluefin, orange roughy, shark and shark fin, or chilean sea bass. All I needed for the carpaccio, in addition to the tuna, was fresh chives, scallion, extra virgin olive oil, and good sea salt and ground white pepper, which I already had. I took one of the two pieces of tuna I was planning on using for the entree, and cut it in half. (I’m only cooking for two people, and I always make way too much). Then I took the half and sliced it horizontally, to make two 1/2″ thick pieces. Put a little olive oil on the cutting board then a slice of plastic wrap on top. Then covered the tuna with another slice of plastic. Next, I carefully pounded the piece of tuna, starting in the middle and sliding the pounder outward, until it was very thin but still intact. 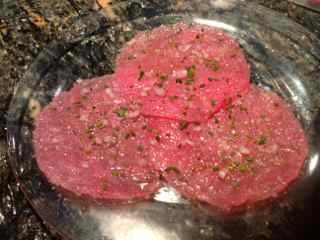 Since my piece of tuna was small, I had to make smaller circles than the recipe called for, so I found a round plastic top from a container from the deli to use as a guide (about 4 1/2″ diameter). If you’re using a larger, 4 oz. tuna steak, you will need a guide about 9″ in diameter. I placed it on top of the plastic covered tuna and carefully cut around it, plastic, tuna and all. Did the same thing for the second piece of tuna. Then, the coolest thing…I had all those little pieces that were cut away from the circles, combined them to make a little ball, put between two plastic sheets, and carefully pounded it out and I had a third circle, which after chilling remained completely intact. No waste! Leaving the tuna in the plastic, I stacked them together and put back in the refrigerator for 30 minutes. When I was ready to serve I just took them out, carefully peeled back the plastic and gently placed on large dinner plate, overlapping in a circular shape. 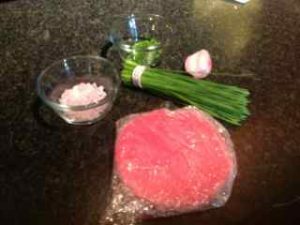 Then, brushed olive oil generously over all three, sprinkled with salt and pepper, then the shallots and chives. Squeeze lemon juice all over, cleaned up the plates and served with the toasts. It was surprisingly easy, I made it at the same time I was working on the entree, and it was delicious! Download the full recipe here. 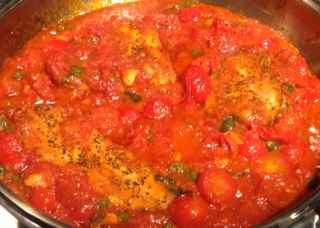 I started Fabio’s Tuna with Tomatoes and Capers while the tuna was chilling. 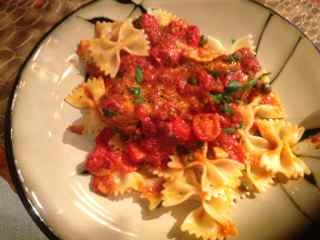 It was done in basically 30 minutes, since I had already made a huge batch of Fabio’s tomato sauce that morning, a really easy recipe. (saved 2 cups for dinner and froze the rest in ziploc bags). Both recipes are here. The only things I changed on the recipe were that I seared the tuna really quickly in a really hot pan with grapeseed oil to get a little sear on the outside, and I served it over pasta.